But that doesn’t make it any easier to race when the breeze is out of the west, a direction notorious for lower velocity and little consistency when it comes to the wind direction. Fantela speaks from first-hand experience. With a 3-13-2, Fantela, who sails with his younger brother Mihovil as a crew, emerged relatively unscathed from the opening day of the regatta and will carry a three-point lead over Diego Botín le Chever and Iago López Marra (ESP) in second and a seven-point advantage over James Peters and Fynn Sterritt (GBR) in third. Of the three races today, Sime Fantela was most pleased with the second one. The short course format used by the 49er class made passing a challenge. Like the Fantela brothers, the team of Botín le Chever and López Marra also struggled in the second race, finishing 16th. But a win in the first race and a fourth in the final one more than balanced that one hiccup. As Spain was unable to qualify for a country berth in the 49er class at last summer’s Hempel Sailing World Championships in Aarhus, Denmark, the top priority for Botín le Chever and López Marra is to earn that berth this year at the world championships in New Zealand at the end of the year. That’s one box that has been ticked by Sime and Mihovil Fantela. They are the defending world champions after a breakout performance in Aarhus and have punched their ticket to Tokyo. However, as they are relatively new to the class—Sime won a gold medal in the 470 in Rio 2016 while Mihovil sailed in the RS:X class until 2016—they are not letting that success go to their heads. The 42-boat strong 49er fleet is exceptionally large for a World Cup. After the last minute announcement of the 49er inclusion in the Pan Am Games, late additions to Miami came from Canada, Chile, and Mexico, along with Argentina, Uruguay, Brazil and the USA who were already racing in the Americas. 15 other nations are represented for a total of 22 nations from 42 boats. The 30-boat 49erFX fleet followed the 49ers later on in the afternoon and in a shifting and variable breeze, just one race could be completed. Sophie Weguelin and Sophie Ainsworth (GBR) found some form and led the race from the top mark through to the finish. Alex Maloney and Molly Meech (NZL) and Germany’s defending champions Victoria Jurczok and Anika Lorenz (GER) followed. Brazil’s Samuel Albrecht and Gabriela Nicolino de Sa shone in the Nacra 17, snapping up two out of three victories. The pair thrived in the 7-9 knot breeze on the Echo racing area and discard the seventh they picked up in race two. 2018 Miami gold medallists Jason Waterhouse and Lisa Darmanin (AUS) took the day’s other race win and are tied with Spain’s Iker Martinez and Olga Maslivets (ESP) for second on five points. 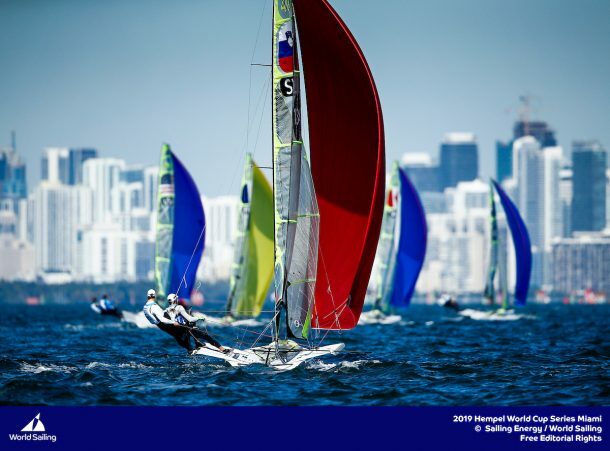 From 27 January to 3 February 2019, Miami will host sailors for the second round of the 2019 Hempel World Cup Series in Coconut Grove. More than 650 sailors from 60 nations will race across the 10 Olympic Events. ©PEDRO MARTINEZ/SAILING ENERGY/WORLD SAILING 29 January, 2019. Shipping Overview: We no longer have the Rowing Club as a venue. The containers must be unloaded, then stored offsite. The unload location is: Lot 71, Seminole Boat Ramp 2710 S. Bayshore Drive Miami, FL 33133 USA Offsite storage can be arranged privately through your forwarder (or through the contact in the link below) but we are also looking into a city option for a nominal fee. The unloading site does not have a loading dock (shelf), and it will not be possible to use the roll on/roll off delivery trucks like we used at Rowing Center. There are no side loader trucks and cranes are your responsibility, but Rock-It Cargo (see link below) will attempt to combine deliveries and minimize crane expense. 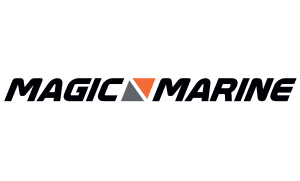 There is not a forklift onsite, but there are nearby marinas that you could coordinate with. There are many warehouses in the Miami area that could accept your containers for unloading and possibly storage. Your forwarder may already have a relationship with one of them. The delivery address and boat ramp is where the 49er, FX and Nacras will be sailing out of, there is launching from the ramp. Let me know if you have any additional questions after referencing http://miami.ussailing.org/competitor_information/shipping/ for other resources Email the regatta office with the timing of your container.